From a satellite, the plumes venting from two volcanoes in the Democratic Republic of the Congo look like clouds. Right now, they're just spewing harmless steam and gas. But that could change. Located near the equator in central Africa, the Nyamuragira and Nyiragongo volcanoes are often obscured from satellite view by clouds. 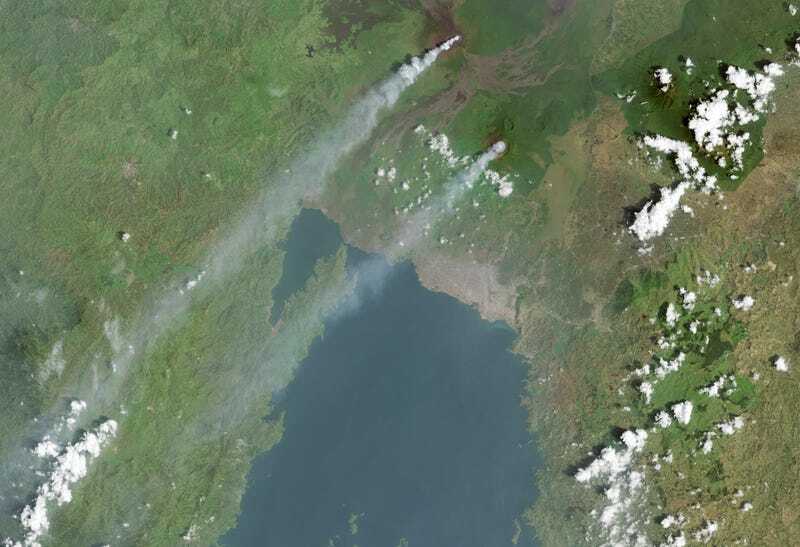 But on February 9, 2015, clear skies afforded an unobstructed view from space of two plumes venting from the volcanic duo in the Democratic Republic of the Congo. Occasionally, Nyiragongo spews more than just steam and volcanic gases. Eruptions of fluid lava from the volcano in 1977 and 2002 had deadly consequences for the city of Goma, which lies about 15 kilometers (9 miles) south of the volcano.